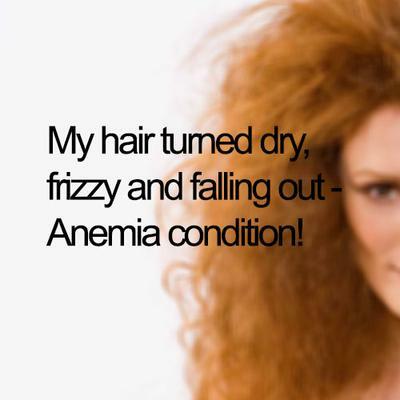 My hair turned dry, frizzy and falling out - Anemia condition! Quite sudden, my hair turned dry, frizzy, wirey and breakage damage throughout and it started falling out. I've had blood tests done, and it seems I am anemic, but the above hair conditions I'm having seemed to come on rather fast and I don't know how long I've been anemic for. It can be the reason for "diseased" hair and that it's falling out too. I say "diseased" because it hasn't been in this awful condition that long...seems it came on a few months ago and again turned bad rather suddenly. Anyone have any other suggestions? Answers and Comments for My hair turned dry, frizzy and falling out - Anemia condition! Hi there; a friend who severely anaemic told me that when she started taking stinging nettles it brought her iron/energy back up quite significantly & quickly. She made a "Nestor" paste (like pesto) and spread it on her toast every morning and froze it in small quantities to add to smoothies soups/sauces. This works really well apparently and doesn't create another problem the way iron pills sometimes do... Hope it helps! Highlighting her hair . I told her to go to a doctor . We just found out she is anemic . Very scary for a 22 year old . Mine started a few months ago after I was hospitalized and started on new meds for blood pressure. I do not know what to do. When my hair got dry, it starting falling out also! I was freaking out, went to my doctor - it turns out the shampoo I was buying from the supermarket was drying out my hair. I started losing patches !! I started using the Somaluxe Shampoo and Conditioner - I bought it online - its like Paradise Lime smelling - and it has all these hydrating ingredients. After 2 weeks of using the Somaluxe Shampoo, my hair was NOT dry anymore. . .and after about a month, I noticed alot of the missing hair patches were growing back in. YOU MUST NOT USE ANY SHAMPOO THAT DRIES YOUR HAIR OR IT WILL FALL. Thats what happen to me. Good luck ! It is possible that you going through a shedding cycle due to shock or drugs. (http://www.dermnetnz.org/hair-nails-sweat/telogen-effluvium.html) Removing gallbladde is not a small change. Your body gone through a lot. This is temporary but I think you should consult this with your MD. Hi. I too have dry frizzy hair, and it is falling out by the handful every morning when I shower. I use natural shampoo without all of those chemicals in it but no matter what I do it still falls out and continues to thin. It is also turning white really fast. My hair just looks awful. When I brush my hair I generally get hair all over my shirt and the sink. I find that I shed through out the day too. I have been tested for thyroid issues but my thyroid is fine. I too am getting quite worried about my hair. They had done blood tests but I do not know if they tested for that. I haven't experienced this till the start of February. I was in a car crash In December and had to have surgery and my goal bladder was taken out. Do not know if this has anything to do with my sudden massive loss of hair and frizziness. I am really worried about my hair loss. Have not seen a doctor since it started doing this. Its really beginning to creep me out. What do you suggest. I have been having the same problems as the other posters. I never had great hair but I didn't have this embarrassing thin hair and bald spots like I have had for the past year. It came on pretty fast and just seems to be getting worse. I am a vegetarian and also have Hep C (for 30 years with no serious issues...yet except a diminished appetite. I will try the vitamin B sublingualy and B12 to see if that helps. I will check here regularly to see if anyone has ideas or posts some positive results. Try the High Potency B-12 vitamins from GNC and Slow Fe iron pills from Walgreens or any local drug store. Me to. I got to the point i didn't want to wash my hair anymore. Months upon Months of it falling out. They said it was stress... then protein. Tests showed that I was borderline anemic, and I got iron pills. Still more hair.... everywhere. I used to be a Hooters waitress. My hair was thick long and gorgeous. This is so disheartening. I felt I was losing my femininity. It has gotten so thin, especially on the sides and around the temples. I even bought Rogaine. Finally someone told me I am probably not absorbing B-12. I got some tablets that dissolve under your tongue. Guess what? a week later I am finally seeing new growth. I guess it could be any of these remedies but I think it was B deficient. My hair is very wavy and at the back of my head it is becoming tangled in the lower side,it look's very odd when i keep long hairs . So please suggest me to keep my hairs straight and smooth permanently. I am sorry to hear about your condition. I remember when I was diagnosed with anemia during my pregnancy and had to take iron supplement with my diet. During that period my hair was dry but never experienced any hair loss. But again, my condition was less serious it depend on type and intensity of anemia. Iron deficency or lack of vitamin B12 (Or body's ability to fully absorb B12 from diet) can both cause different types of anemia. And both vitamin B12 and Iron are important part of healthy hair growth. Side effects like hair loss, dry hair and dry scalp can happen immediately or months after. It depends how much your body depleted its Vitamin B12 or Iron stores. The best idea is to consult your MD and if possible to treat this naturally by adding more Vitamin B12 and iron-rich foods like lamb, lamb?s liver, Egg, Oysters, fish and other sea foods into your diet.